Summer is here and the time is right for potato salad and a picnic. May The 99 Cent Chef recommend a pleasant outing to Will Rogers' Polo Club? Take winding, tree-lined Sunset Boulevard into Pacific Palisades for an equestrian game gazing picnic. And what goes more splendidly with croquet played on horseback than The Chef's Mackerel Potato Salad? On the first day of summer The Chef took a group including his wife, her parents, and, visiting from Austin, his sister Denise and her husband Dale, to a 9:30 a.m. polo match at Will Rogers State Historical Park. Parking is eight dollars, but well worth it for 4 hours of equestrian entertainment -- the event itself is open to the public and ticket-free. You decamp with your picnic basket and lawn chairs, and yes, beer or wine is allowed, to find a spot along the emerald green field - flanked by a small hill on one side and an eucalyptus tree shaded area next to the announcer's booth on the other side. 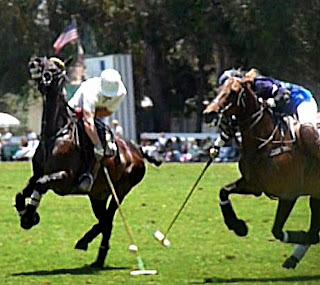 If you have not watched a polo match before, think of mallet-wielding soccer players on horseback, dressed ever so elegantly in field boots, thundering down the field swatting at a softball-sized polo ball. You can go to willrogerspolo.org and click here for instructions on the art of the polo match. The main website gives you directions to Will Rogers State Park and Saturday and Sunday polo game times, which run until October. You can take a break from the polo matches with a hike in the park or a tour of Will Rogers' cowboy-styled residence. Below is the Chef's video visit to a Will Rogers Polo Club Match. Play it here. The video runs 2 minutes, 29 seconds. 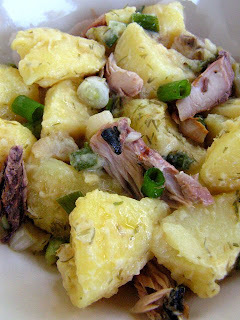 Now on to the main food event -- Mackerel Potato Salad. The Chef offers a German style vinegar/mustard dressing mixed into yellow potatoes and packaged mackerel, both bought on sale at this 99c only Store. You can use any canned fish in water including sardines, salmon, herring or tuna, often on sale at any market. Chopped green onion adds color and crunch. You can serve this potato salad warm or cold, and it complements sandwiches and beer. Chop potatoes into about 1 inch pieces with or without skin on. Add to low boiling water for about 10-15 minutes. Done when easily pierced with a fork. Drain and set aside while preparing dressing. 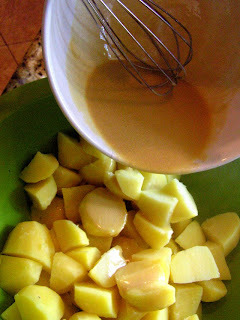 Whisk together mustard, oil, sugar, and vinegar. 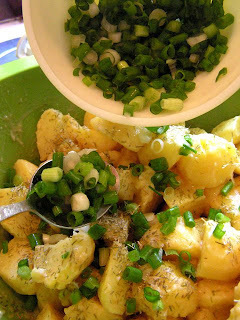 Mix together potatoes, dressing, and dill and season with salt and pepper. Finally, drain and lightly mix in fish, trying to keep fish as larger flakes. Serve warm or chilled. Thanks for the heads up Bargain Babe. 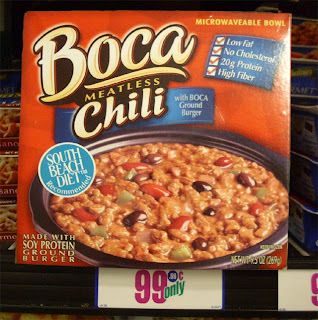 Boca Meatless Chili please come back! I found a box in my freezer, bought a couple of months ago from this 99c only Store, gave it a quick zapping, and boy, is it good. I keep looking for it to return, but to no avail. If you find it at your local store, let my readers know! Deli case frozen, this quick lunch dish is a great Deal of the Day. Made with red and black beans in a chili sauce, it's surprisingly spicy for a mainstream frozen entree. While only recently exposed to a vegetarian Boca Burger, this Chef is impressed with the Boca brand. 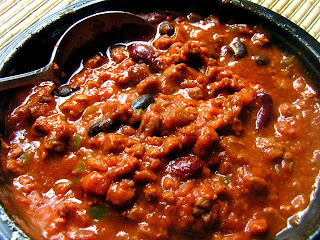 The meat substitute pieces are tiny and a little spongy, but has a good taste; it's certainly a pleasant light alternative to heavy oily canned meat chili. The broth is somewhat thin, but flavorful, and having beans that are not mush is a nice change of pace. Chunks of onion and bell pepper blend well with the Anaheim chile and tomato sauce. The serving is small but adequate for a light vegetarian lunch, and well worth the 99.99 cents the Chef paid. On a scale from one to nine, the Chef gives it an eight. Mexican mole is a complex mix of many flavors and comes in a rainbow of colors. When The Chef goes to Tijuana a favorite stop is a stall market off the main drag of Avenida Revolucion with a mryiad of moles in clear plastic hampers ready to be scooped out. These pastes of green, red and dark brown are intensely flavored with spices, nuts and chocolate. Most restaurant moles are of the dark brown variety. This Chef picked up a small ready-to-use jar on sale at his local Latin market for $1.99 - you get about 8 servings out of an eight ounce jar, so this mole fits the budget. Use your favorite discounted cuts of chicken. 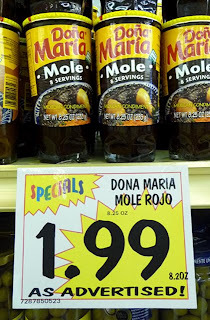 The store-bought brand of Dona Maria has a peanut/chocolate flavor with a slight spicy chile bite and is quite tasty. This is a one-pot dish that tastes better reheated the next day and goes well with rice and a salad. Preheat oven to 375 degrees. 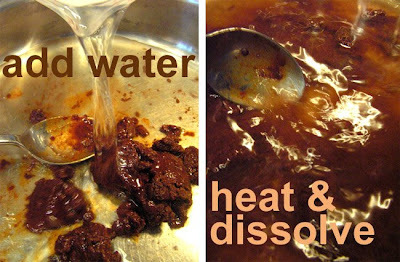 In a large deep pan or pot, dissolve and mix mole into hot water. Add chicken and bake uncovered for 2 hours (breast meat needs less time, about 1 1/2 hours, just pierce meat with a fork; juices should run clear). Remove and place on stove top. Spoon out as much grease as possible. 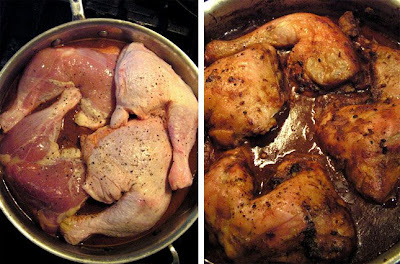 Heat mole and chicken for about 15 minutes on the stove top at a low simmer. Reduce by half to thicken. 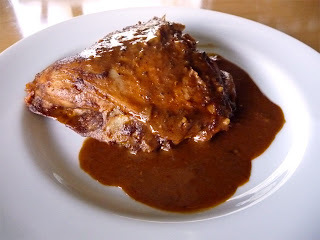 Serve with white or brown rice to help soak up all the delicious mole. 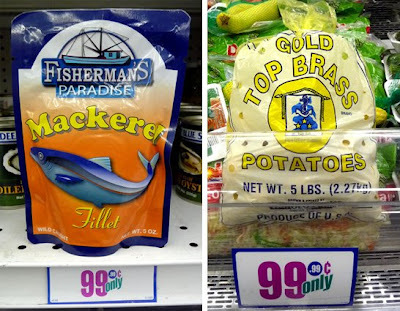 Canned seafood is a 99 Cent Chef budget specialty. Look blog-backward and you will find recipes for "Baby Clams and Spaghetti", a "Salmon Shmear", "Clam and Artichoke Pita Pizzas" and the Left-leaning "Cesar Chavez Salad", all using canned (or foil pouched) seafood. Now you can add Salmon Burgers. If you are lucky enough to find a 15 oz. 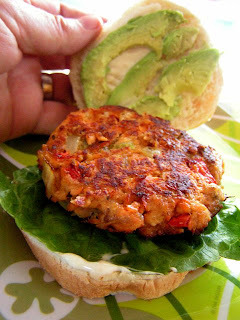 large can of salmon in your local dollar store, you can make enough salmon burgers to feed the whole family, with The 99 Cent Chef's salmon burger recipe. Lately, the Chef has run across 3 oz. soft packs and 7 oz. 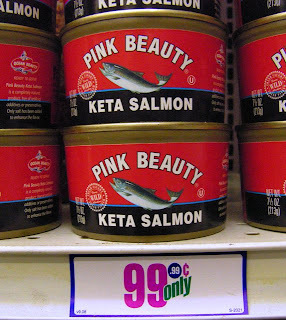 cans of cooked salmon; that's enough for 1-3 patties. Ah, the good old days when large 15 oz. cans were everywhere for around a buck! For these larger cans, just add 3 times my filler ingredients ( about 3 eggs, a whole onion and bell pepper, celery stalk, and 1 cup of bread crumbs). 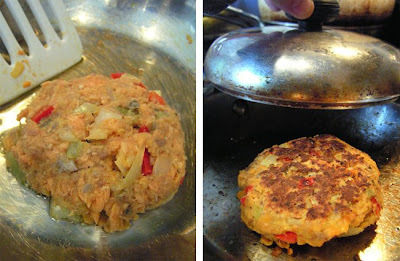 For a burger, make sure to cover salmon patty when cooking, to firm it up; if it is served without bread then cook uncovered for a flaky tender patty. As a bonus, The Chef has come up with the perfect salmon patty pairing: ginger/lime mayo aioli. Canned salmon in water is ideal, just drain; if canned in oil, then you don't need oil for frying, it has plenty already! For your burger add favorite topping including, tomato, greens, and avocado. Add 1 tbsp. 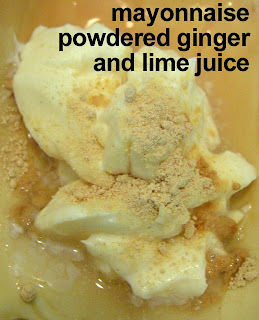 of powdered ginger, 1tsp. of lime/lemon juice (optional), and mix into 1/4 cup of mayo. The longer it sets the more flavorful. Drain canned salmon and remove any bone (sometimes the white backbone is left in). Chop veggies fine and saute in frying pan with 1 tbsp. oil for 5 minutes until soft. 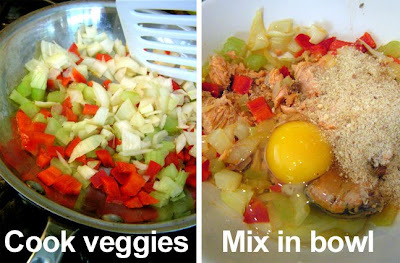 In a bowl add salmon, cooked veggies, one egg, garlic and bread crumbs (or one fresh crumbled, toasted slice of bread), and mix well. Heat one tbsp. oil over medium heat. Form hamburger-sized patties and cook covered for about 5 minutes each side. Patties will firm up when covered; if you are serving them without buns, cook uncovered and they will be more moist and flaky. Serve with the Chef's Ginger Mayo Aioli on the side or on a bun. Welcome to the playoffs, and I don't mean this week's NBA Lakers vs. Orlando series. 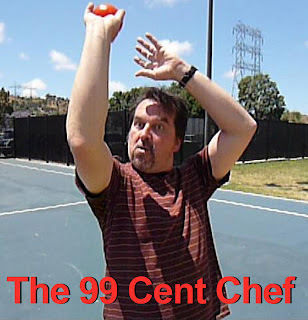 This is basketball played by the rulebook of The 99 Cent Chef. Great NBA All-Star match-ups have included Magic and Bird, Kobe and LeBron, and now: Pete vs. The 99 Cent Chef! It's a triple-double of a basketball video event. One-on-one has never been so much fun. Like in The Chef's baseball video from last year, playing with food is taken to surreal and fanciful extremes. What starts out as a simple 5 basket pickup game turns into a food free-for-all, and you can be sure things go splat when Pete and The Chef drive to the hoop. During this week of the NBA playoffs, be a sport and join The Chef for his outlandish halftime entertainment event. Play it here. The video runs 4 minutes, 42 seconds. 99 thanks to Pete for a slamdunking performance! Checkout Pete's clever Sports Shorts Blog by clicking here, and for his YouTube videos just click here. And extra thanks to my fellow Culver City art gallery hopping neighbor Bob McGinness for additional creative camerawork. Cheapest Happy Hour in Beverly Hills? What is wrong with this picture? No, not the skewed angle; I shoot that way, influenced by the street photographers Gary Winogrand, William Eggleston and Robert Frank. 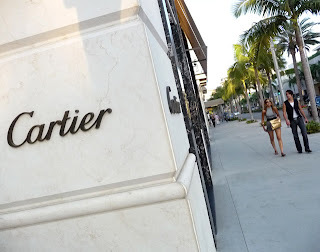 No, it's that Cartier, the Beverly Hills jewelry emporium, is on The 99 Cent Chef's foodblog, and that the chintzy chef is in fact imbibing three doors down on ritzy Rodeo Drive. Welcome to my new feature: reviews of economical drinking and dining in Los Angeles. The Chef doesn't eat out enough, and this makes the perfect excuse to explore cheap eats citywide. Look out, S. Irene Virbila and Jonathan Gold -- a new restaurant reviewer is in town! I will feature meals that a proletarian/student/struggling artist/filmmaker can afford, not just local "expense account" dining reviews. Happy hours and low-cost dining will be my purview, while in higher-end restaurants, the focus is on the least expensive menu items. And if there is a free parking spot restaurant close, The Chef will spill the beans! My future postings will be generously served with scrumptious photos with a side of luscious video. Squeezing a dime does not limit you to a fast food diet, as my first happy hour review shows. So pull up a bar stool and let The 99 Cent Chef show you the ropes of Cafe Rodeo's Bar 360 in Beverly Hills. Valet parking is available at the Luxe Hotel on 360 N. Rodeo Dr., where Cafe Rodeo's Bar 360 is housed; of course I am too cheap to indulge, since about three blocks north, just before Santa Monica Boulevard, is ample city parking for $1 an hour - but bring plenty of quarters, since these are old-style meters. 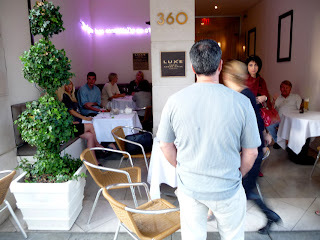 A short walk -- past the well-heeled natives mixed with gawking, camera wielding tourists -- brings you to the Luxe Hotel, where right across from the check-in desk is Cafe Rodeo, an upscale room with a dozen white cloth-covered tables and featuring Bar 360, a six-stool copper-covered bar. Sports play on the 36-inch flat screen and the bartender is quick to hand you the happy hour menu, featuring a Cosmopolitan and Dirty Martini for a mere $3.60. With time clicking off on my city parking meter, I quickly order the Cosmo and $3.60 Parmesano Pomme Frittes appetizer. 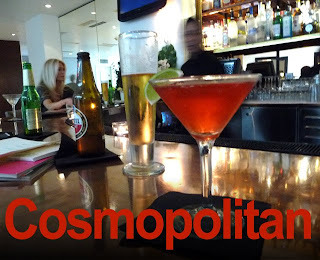 The Cosmo is sweet and colored like cranberry juice but with a kick. 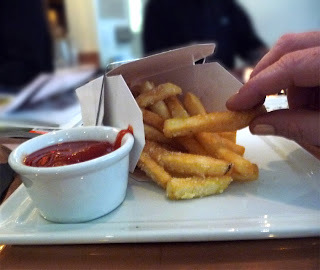 The pomme frittes are cleverly served spilling out of a Chinese to-go box and liberally sprinkled with parmesan and a bowl of ketchup on the side. They go down well, as I lick my finger to coat it in leftover parmesan. The fries are good as frozen-style fries can be, but disappointing for a high end happy hour appitizer - fresh cut would seem appropriate. Next up is perfection in a cocktail glass - Cafe Rodeo's chilled martini made with Gordon's gin and a single plump olive. The drinks are the star here - two good ones in a row. An order of fish tacos and fried chicken skewers follow. The 2 fish small tacos are made with lightly breaded tilapia chopped fish fillets with a chipotle chili spicy aioli, served on a corn tortilla sprinkled with minced lettuce. 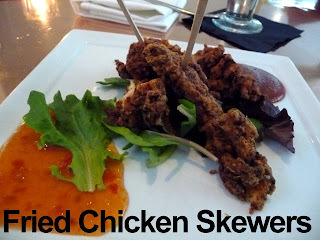 While tasting fine, this appetizer is way overpriced at $7 for this budget chef (I often get 5 oz. frozen tilapia fillets at my local 99c only Store) . Stick with the Fried Chicken Skewers, made with white breast meat that's crunchy coated with a mix including bread crumbs. Two dipping sauces flank the large fried skewers; one is a light barbeque sauce and the other is a sweet/hot Thai chili sauce that tastes straight out of the bottle, but it's okay; I like it that way. At $3.60, the chicken skewers are the best bar food deal, although too thinly sliced, which makes them on the dryer side - a thicker cut would result in a moist chicken appetizer. Service is top notch at the bar. My visit was during the middle of the week, so it was uncrowded; patio tables are available outside at the Rodeo Drive entrance, as well. 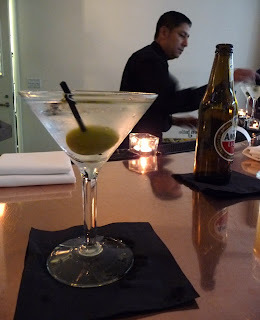 So when you drop-off your out-of-towners on Rodeo Drive, tell them you'll be waiting at Cafe Rodeo, sipping a $3.60 Cosmopolitan or Martini - this is a great Beverly Hills happy hour deal: just be judicious in choosing an appetizer. Happy Hours: Monday through Friday from 4:30 to 7:30. Martinis and select appetizers $3.60. Other appetizers $7-$9. 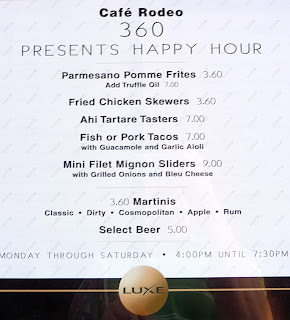 Food items change month to month, so call for the latest happy hour menu. Parking: Valet or city meters, on same side of the street just South of Santa Monica Boulevard. Bring pocket change, $1 per hour.